Debenham & Smith, Southampton; cropped Book-plate image, from Cats for Pleasure & Profit (1909 edition) by Frances Simpson¹, courtesy of The Harrison Weir Collection. Following in the paw-prints of Ch.Backwell Jogram, 'Teufel', was a Black Smoke male, who kept the Smoke Persian variety at the forefront of Longhairs. He was bred and owned by a relatively new breeder and fancier, Mrs Sinkins, of Aldermoor House, Southampton. 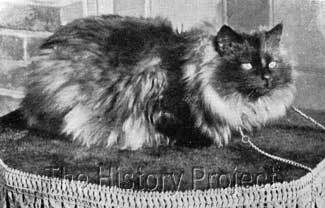 A popular and effective organiser, Mrs Sinkins later became President of Committee for the Southern Counties Cat Club, which ran the popular and well attended annual Westminster Show. 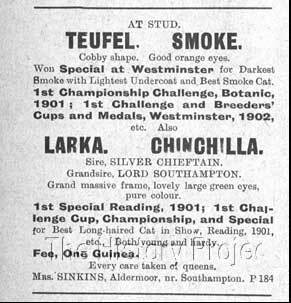 Teufel's sire was 'Chokra' a Smoke Persian (1899) owned by Mrs Sinkins, and his dam was 'Chit'(1899), a daughter of the famous Silver, Ch.Lord Southampton, ex Sylvia II, bred by Mrs Sinkins. Sylvia was in turn sired by Mrs McLaren Morrison's famous Silver male, Ch. (The) Nizam. Mrs. Sinkins. Photo: Fur & Feather3, January 24, 1913. Courtesy of The Harrison Weir Collection. 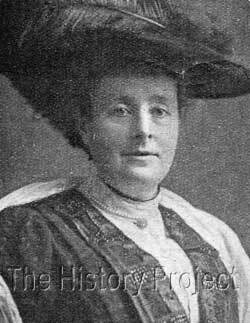 Mrs Sinkins other great love was Chinchilla's and in this respect she had consolidated her lines by securing two daughters of Ch.Lord Southampton, which were alternately bred for Silvers and for Smokes. It was a well-accepted premise, even in these early times, that to breed clear-coated silvers, it was best to outcross to a good clear coated smoke. From this Chinchilla male and the dam of 'Teufel', came two silver half-sisters, Marguerite and Silverine, and another breeding between 'Chit' and Mrs Champion's 'Lord Argent', produced a litter of Chinchillas and Silver, half-siblings. "In my opinion, it is a fatal mistake to mate smokes with blues, as they can then lose this white under-coat. I think one obtains it best by mating a smoke-bred smoke cat with either a silver-bred smoke or else with a silver cat, as unmarked as possible, who possesses a smoke ancestor. Some day I should like to try mating a black with a pale silver, just as an experiment. "As to the eye colour, there can be no two opinions. The deeper the orange, the better. "I do not find smokes at all delicate, no more so than the common or garden cat. All my queens have entire freedom, one in particular being a first-rate ratter and mouser, even catching moles sometimes. And they live out of doors in unheated houses all the year round, even in the most severe winter. "It seems hard that all Persians have to pass through an 'ugly' period - luckily a short one - when they change their coats, looking ragged and certainly not their best. Smokes and blacks then show the brown tinge, even worse than chinchillas, as its gives them the poverty-stricken appearance of rusty moulting - though I must say 'Teufel' has so far been the exception, taking all honours at one show when in full moult. 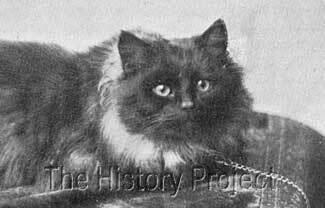 However their good time fully compensates for the shabby period, and a typical smoke, with his large orange eyes set in his black face, with light ear tufts and frill, his white undercoat showing with every movement, is a thing of beauty hard to beat, and I feel sure the smoke variety has a great future before it." It would appear that Mrs Sinkins and Mrs H.V.James (Backwell) had a good working relationship as the guardians of the 'smoke' dream. Mrs Sinkins appears to have acquired a smoke daughter of 'Ch.Backwell Jogram', and mated it to 'Teufel', producing a litter of smokes, one of which was named 'Backwell Jollity', presumably because it went back to Mrs James. A litter sister, 'Queenie' who was subsequently sold to Mrs Biles, was eventually line-bred back to 'Teufel' to produce 'Teufel II' (born 1st August, 1905). 'Teufel II' found his way to the United States, under the ownership of Annie S. Greely, or Dorchester, Massachusetts, where he was used to reinforce the smoke dream on another continent. Two cropped photographs of 'Teufel', the first, is from opp.Pg 40,'Cats for Pleasure & Profit'(1909 edition)1 and the second is from 'Pg185, 'The Book of the Cat', (1903)2 both by Frances Simpson. The first photo is by Debenham & Smith, Southampton. Both images, courtesy of The Harrison Weir Collection. At right is Mrs Sinkins' cattery advertisement as it appeared in the January 24th, 1903 edition of 'Our Cats'5, edited by Mrs Herbert Ransome. (Photo: courtesy of The Harrison Weir Collection). "Good smokes of his type are few and far between. His colouring is perfect, and his face and head quite free from tabby markings that so often mar the beauty of this breed." Cats for Pleasure & Profit, by Frances Simpson, published by Sir Isaac Pitman & Sons (1909). The Book of The Cat, by Frances Simpson, published by Cassell & Co (1903). Fur & Feather, January 24, 1913. The Cat Club Register, Vol V, 1902. Our Cats, January 24, 1903.